Alexandria Ocasio-Cortez just suffered the biggest embarrassment of her life. The self-identified Democrat socialist got caught up in the biggest scandal of her career. That’s because Ocasio-Cortez told one huge lie and you won’t believe what happened next. Ocasio-Cortez unveiled her long-awaited “Green New Deal” to much media fanfare. But instead of it being her crowning achievement, the “Green New Deal” turned into a national laughing stock. Her office immediately raced to cover up the error by deleting the FAQ page. And Cornell professor Robert Hockett – who advised Ocasio-Cortez on the Green New Deal – went on Tucker Carlson’s Fox News program to perform damage control. Carlson pressed Hockett on Ocasio-Cortez guaranteeing income for Americans who did not want to work. 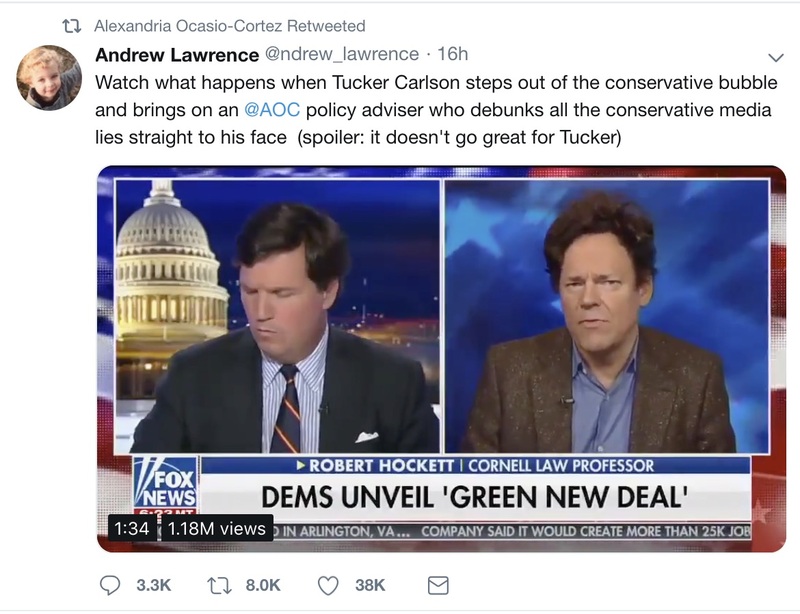 Hockett falsely claimed that the version Carlson was referring to was a forgery doctored by conservatives to make Ocasio-Cortez look bad. …She’s actually tweeted it out to laugh at it. If you look at her latest tweets, it seems that apparently, some Republicans have put it out there,” Hockett falsely claimed. Hockett later apologized for spreading misinformation. “It appears there was more than one document being discussed yesterday, only one of which I had heard about with any definiteness by last evening after a long day of media appearances – namely, the one referred to by the Congresswoman in her tweet,” Hockett wrote in a statement to the Daily Caller. But while Hockett owned up to his error, Ocasio-Cortez and her chief of staff continued to lie and claim that the “Green New Deal” calling for taxpayer money going to Americans who didn’t want to work was fake news. Ocasio-Cortez retweeted a video of Hockett stating that the frequently asked questions page was a forgery. Ocasio-Cortez’s chief of staff Saikat Chakrabarti also went on Twitter and lied about how the frequently asked questions page was initially posted. This was clearly a lie. Alert-researchers on social media quickly discovered that Chakrabarti was the one who posted the document. Every leading Democrat signed on to her communist proposal without reading it. But when they saw it endorsed a Marxist plan to steal money from working Americans and give it to lay-abouts who did not want to work, they panicked over their self-inflicted political wound. So Ocasio-Cortez tried to fix the problem by lying, knowing that the so-called “mainstream” media would buy her excuses no questions asked because they worship her politically.